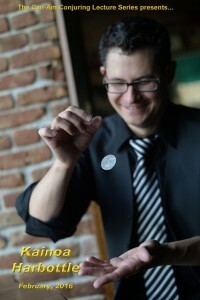 We’re super happy and fortunate to be hosting none other than Kainoa Harbottle . This absolute master of coin magic (among many other disciplines) will be here in Victoria for your viewing pleasure on Sunday February 28 at the Harbor Towers Hotel at 7pm. Cost is still only $20 for members and $40 for non-members. Either way it’s a steal of a deal, so Mark your calendars and be sure to show your VMC support by coming out and learning from our first guest of the year.